This ship was not excavated first and then lifted out of the water, but the reverse (Saunders, 1962:14). She was lifted up from her claybed and moved in several steps to shallower locations until she could be excavated in “dry-dock.” This was possible only because the hull was in good condition. The Baltic Sea is brackish water. It does not have a wood destroying organism called Teredo navalis which is found in the oceans. Therefore timbers long sunken in the Baltic are well preserved. 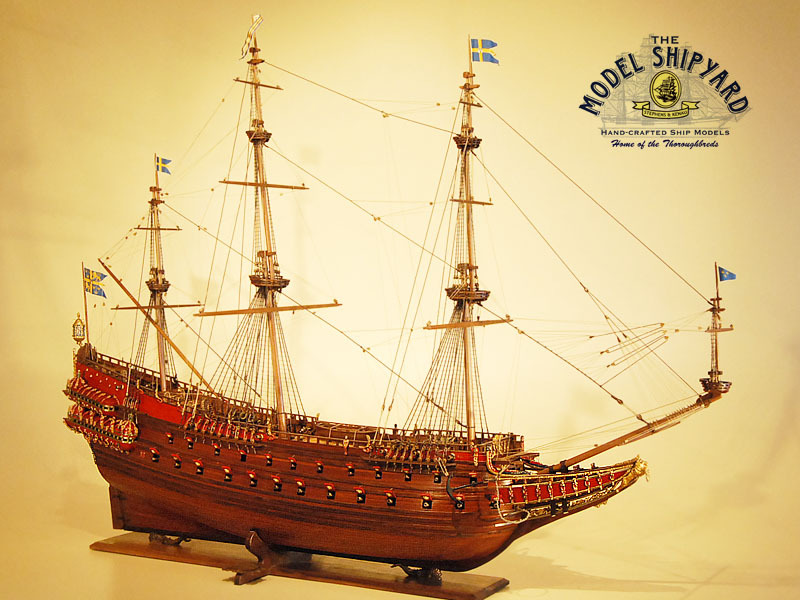 A great Swedish king who ruled Scandinavia in the early 17th century had to have a fleet of warships to patrol the Baltic and ordered 4 new galleons. One was to be the royal mighty battle galleon called Vasa, greater than any ship ever built at that time. The king himself dictated the Vasa’s measurements and no one dared argue against him. It was of the type we call skeleton-build, same build as e.g. the Sovereign of the Seas from 1637 (McGrail 1993:46). 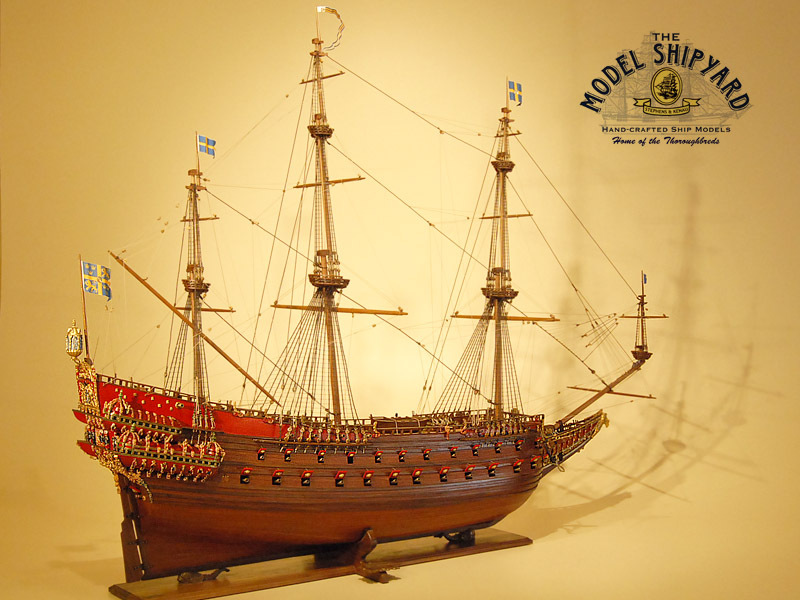 It had two gun decks and held 64 bronze cannons. Various woods were used but predominantly northern oak – a very sturdy wood. It is said that a total of 40 acres (16 ha) of timber was used. Timbers of the bow were steamed (to curve them) and fixed and the close-set ribs were clad with heavy timber walls – a masterpiece of triple-laminated oaken walls 18″ (46 cm) thick. A web of masts and spars rose slowly. The top gallant on the main mast soared to 190 ft (57 m). The Vasa’s rudder stood over 30 feet tall (Almqvist 1990:6). Carvings were made separately in workshops. Later these were attached on the bow and round the high stern castle. Stern ornaments (painted red, gold, blue) were carved gods, demons, kings, knights, warriors, cherubs, mermaids, weird animal shapes – all meant to scare the enemies and also symbolize power, courage and cruelty. 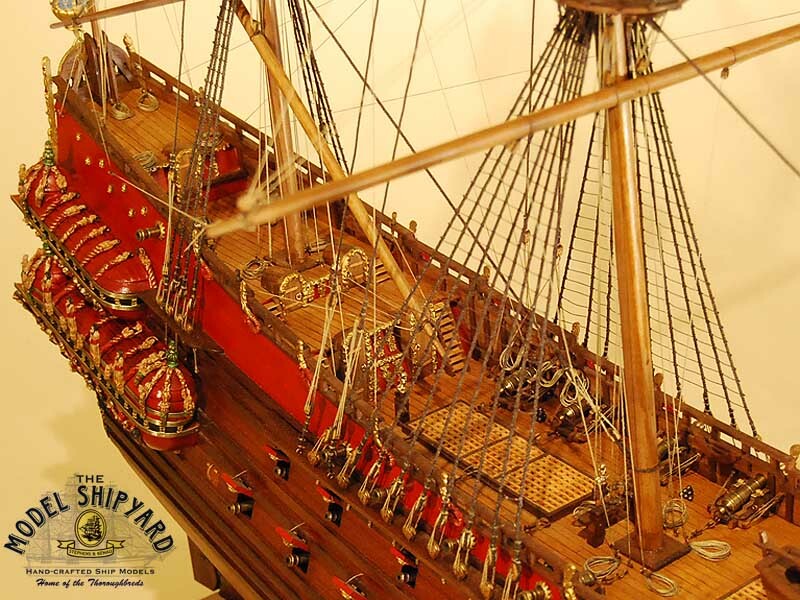 The ship was painted in colors of Baroque style. It took 3 steady years to build Vasa, turning her into a floating work of art and a weapon of war. Sweden had a great copper mountain, so copper was the raw material used for making bronze cannons. 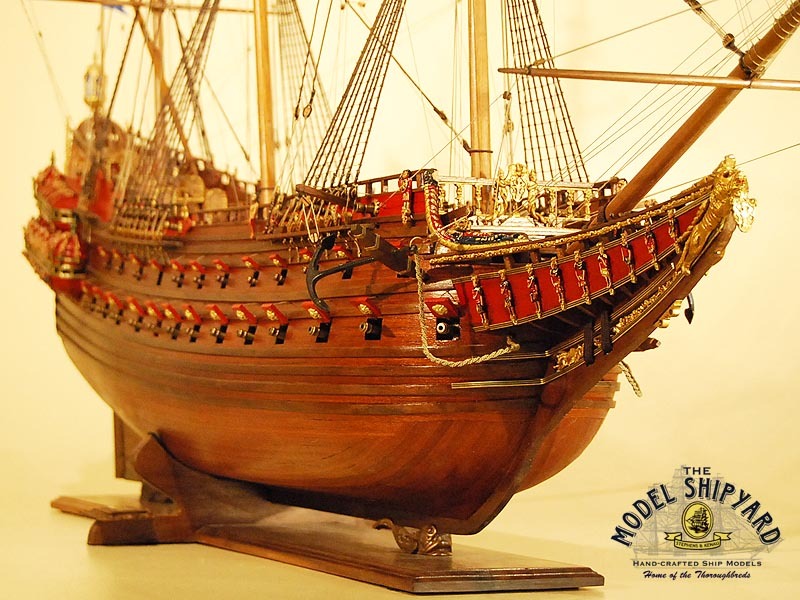 All in all, the king had 256 cannons made for 4 ships! As a rich, powerful and mighty monarch, “His” cannons bore the moulded letters G.A.R.S. for his Latinized name; Gustavus Adolphus Rex Sueciae. The cannons were heavily reinforced at the breech and 64 weighed approximately 100 tons. Vasa’s ballast equalled 120 tons of stone. She carried additional weight of cannon balls, gunpowder, ancillary firearms, food in casks, officers and a crew of 133 sailors. Vasa sank to 100 ft below the surface of the harbor and about 100 yards from the shore. Even back then, the harbor was cold water but possibly clearer than now. 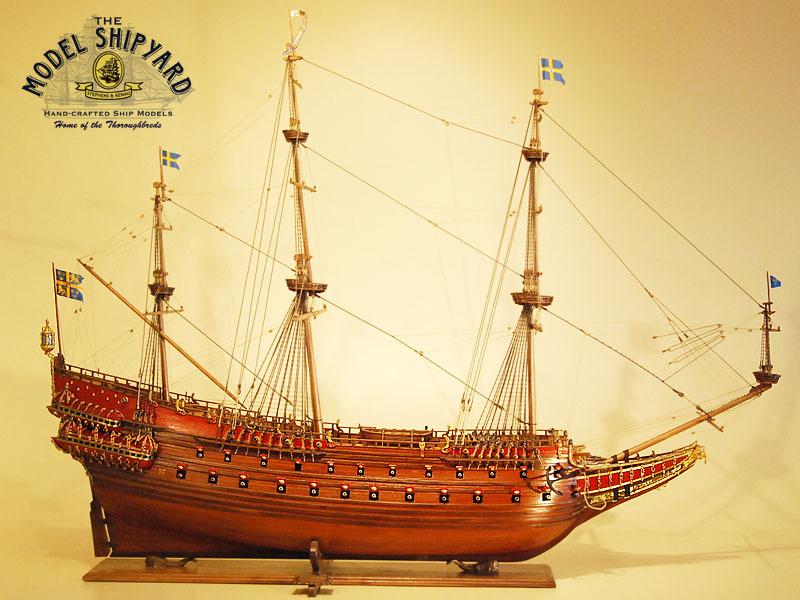 The first attempt at salvaging Vasa began shortly after the memorial service of her drowned victims. 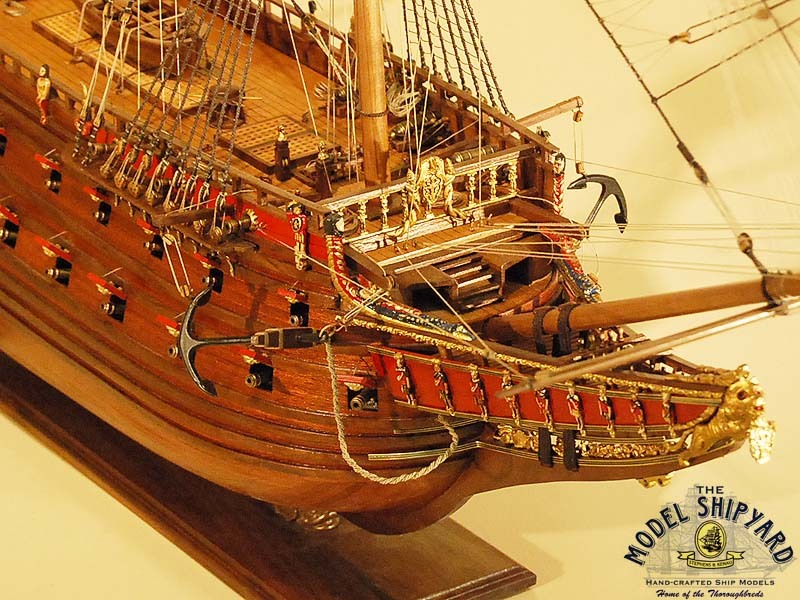 Ian Bulmer, Royal Engineer from England, succeeded in setting Vasa on an even keel, because her main mast stuck out of the water at an angle. His further efforts were unsuccessful. Most of her carvings were wrenched off with grappling irons in other salvaging attempts and these all sank into the mud. The ship settled deeper into mud and clay.